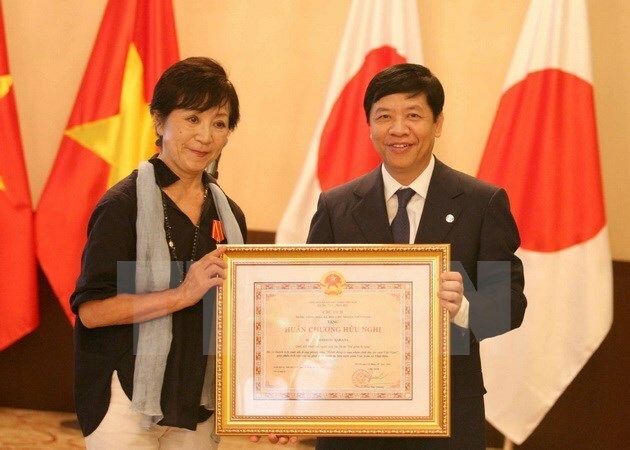 Tokyo (VNA) – The embassy of Vietnam in Japan and the Vietnam Association of Victims of Agent Orange (VAVA) held a ceremony in Tokyo on August 10 to present the Friendship Order to Masako Sakata in recognition of her dedication to the campaign “Actions for Vietnamese AO victims”. Speaking at the event, Vietnamese Ambassador to Japan Nguyen Quoc Cuong lauded Masako for directing two documentaries about Vietnamese AO victims and launching the fund “Seed of Hope” that provided scholarships for more than 100 Vietnamese students who are AO victims. Masako said the death of her American cameraman husband from AO effects after fighting in Vietnam prompted her to travel to Vietnam in 2004 to make the first film about the topic. She hoped that her two documentaries, which will be screened in France in this October, will attract more viewers, thereby raising their awareness of the AO’s consequences. At the event, she also presented financial aid to VAVA on behalf of the “Seed of Hope” fund. Her documentary film “AO – A Personal Requiem” was completed in 2007 while the other “A Vietnamese Father’s Journey to the Battlefield” was made in 2011. Both of them were screened in many countries and won Japanese and international prizes.